Beaded-edge satin flats. Over 40 colors to choose from. Pinked edge on top and bottom. Your copy printed in gold foil unless otherwise requested. 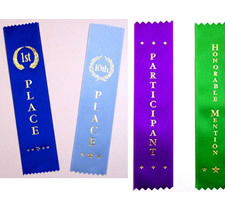 Wide range of clipart and doo-dads available to dress up your ribbons. Click here for more information and prices. Beaded-edge satin peak tops available in over 40 colors. Peak tops include eyelet, matching string and event card. 3″ event card imprinted with name, date, event, judge or swim information. 4″ blank event cards available for computer printed labels (no extra charge). Pinked bottoms. Your copy printed in gold unless otherwise requested. Click here for more information and prices. 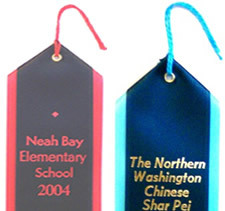 Peak overlays feature a 2″ ribbon over a contrasting 2-1/2″ ribbon to create a layered look. Your copy, with clip art, printed in gold foil unless otherwise requested. Peak overlays include eyelet, matching string and event card. 3″ event card includes date, name, event, judge or swim information. 4″ blank event cards available for computer-generated labels at no extra charge. Click here for more information and prices. Horizontal badge ribbons available in over 40 colors. Imprinted with your copy in gold foil unless otherwise requested. Pinked edges. 2″. Select 3″ – 4″ in length. Double-sided tape included. Click here for more information and prices. Vertical badge ribbons. 2″ in width. Tape included. Pinked edge, top and bottom. Click here for more information and prices. Rosettes are custom made when you order them. They are pictured by design and can be ordered in any available color or color combination of your choice. If you don’t see the perfect one, we can improvise. 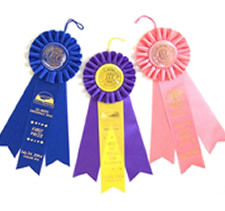 Rosettes are made of beaded-edge satin ribbon. Your print in gold on the rosette center and 1 streamer is included. For print on more than one streamer add $1.00 per streamer. To add name to side streamer, add $4.50 each. 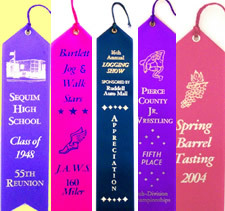 For longer or extra streamers add $.05 per inch per streamer. We will be happy to provide you with the perfect rosette for your special event! Click here for more information and prices. 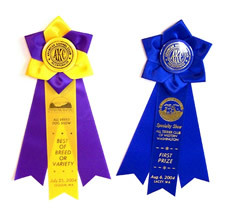 We came up with the designs for our dog show ribbons with the assistance of an AKC-licensed show superintendent. They have been very well received! 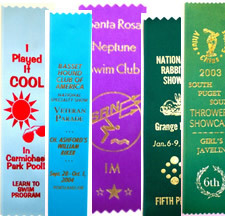 Mix and match ribbons from any of our pages to meet your club’s needs. Any style shown can be made in colors that meet your requirements with your copy and the AKC logo. Click here for more information. 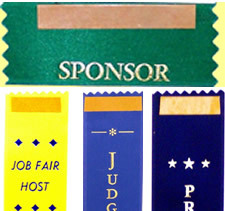 Preprinted, our stock ribbons are ready for a quick turnaround. Traditional placement colors for type of event. Click here for more information.